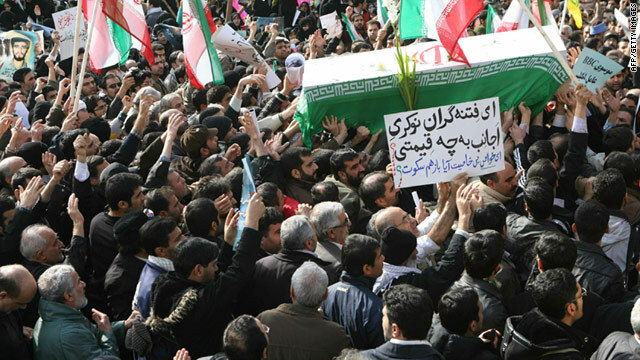 People carry the coffin of Saneh Jaleh during his funeral Wednesday in Tehran. Jaleh died in anti-government protests Monday. Tehran, Iran (CNN) -- Thousands of people, many of them Iranian government supporters, turned up in Tehran on Wednesday for the funeral of a man killed in anti-government protests. The gathering near Tehran University followed a crackdown on anti-government protests Monday and Tuesday's calls from Iranian lawmakers for the execution of opposition leaders. Government officials said 26-year-old Sana Jaleh was shot to death Monday by members of an outlawed group called the People's Mujahedeen Organization of Iran. The group, which is also known as the Mojahedin-e Khalq, has opposed the Iranian government for decades. Government officials also claim that Jaleh was part of the pro-government Basij militia, but some who knew Jaleh dispute that account. And in a statement Wednesday, the People's Mujahedeen called the government's version of events "a preposterous lie." According to the group, it was the Iranian authorities who fired on the demonstrators. "These desperate attempts and ludicrous allegations against the PMOI, much like clerical regime's other attempts at shutting down the internet and mobile phones, or jamming satellite television broadcasts, will prove fruitless for the shaky clerical regime," the group said. "The uprising and the struggle of the Iranian people shall continue until the downfall of the ruling religious fascism and the establishment of democracy." The semi-official Fars news agency also blamed the People's Mujahedeen for a second reported death in Monday's protests. Fars reported that the victim, identified as Mohammad Mokhtari, was buried on Wednesday in southern Tehran, where mourners blamed Iranian opposition leaders for his death and called for their execution. Similar calls came during Jaleh's funeral procession, with demonstrators shouting anti-American slogans and holding signs calling for the prosecution of opposition leaders Mehdi Karrubi and Mir Hossein Moussavi. Iranian lawmakers Tuesday called for Karrubi and Moussavi to be put to death. In an interview with state-run news agency IRNA, Iranian judiciary spokesman Gholam-Hussein Mohseni-Ejei said Wednesday that "The people have demanded the execution of these people ... and the judiciary will fulfill its duty." Last week, the Iranian government rounded up activists after Karrubi and Moussavi called for supporters to gather at Azadi Square -- the site of mass protests by Iran's opposition movement after the disputed 2009 presidential elections. Despite the security presence, tens of thousands of demonstrators marched in Tehran on Monday. Meanwhile, the opposition-run Saham News website reported that at least 20 security agents broke into the home of Karrubi's son, Hossein Karrubi, on Wednesday. Karrubi was not in the apartment at the time, but the agents broke down the door, ransacked his home, and destroyed much of his belongings, Saham News reported. Iran's government has praised Egyptian demonstrators who brought down President Hosni Mubarak's iron-fisted rule, but at the same time is cracking down on protesters decrying its own hardline regime. Mubarak resigned on Friday after 18 days of protests, and similar unrest has broken out in several other Middle Eastern states.